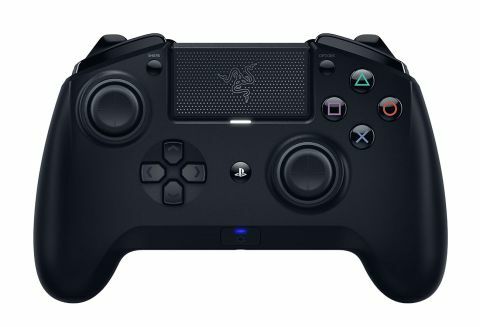 The new pro-gaming Raiju controller is a godsend for PS4 owners, but does the PC need it? A luxurious controller, the Razer Raiju Tournament Edition positions itself as a console pro gamer's dream. But on PC, it can't compete with mouse and keyboard. There’s no getting around it: the Razer Raiju Tournament Edition controller is a luxury item. Designed as a premium alternative to the PlayStation 4’s DualShock 4 controller, at $150 / £150 / AU$250 it’s more than double the price of its first-party alternative. There are few DualShock 4 owners who’d argue that it lacks in comfort and functionality. Still, there’s always room for premium items for those who want them, and that’s definitely the category Razer’s newest Raiju iteration belongs in. Want more information about playing PC games with a controller? Check out our guide to the best controller for PC gaming. The most obvious difference between the Raiju and the DualShock 4 is the former’s size: it’s definitely more of a fistful, and yet it’s a delight to hold – especially for those who prefer the bulkier dimensions of Microsoft’s Xbox One controller. There’s a pleasant textured grip on the underside of each wing, and the L2/R2 buttons are more emphatically angled upwards at the edges. The four face buttons audibly click when pressed, and the ‘Share’ and ‘Option’ buttons protrude from the controller itself, making them much easier to press on the fly. Once you’ve taken the Raiju in your grip, you’ll immediately notice the two large underside buttons, which are situated where most people rest their middle fingers. These buttons are M3 and M4 respectively, while two extra bumper buttons, M1 and M2, sit just inside the existing bumper buttons. Meanwhile, the L2/R2 buttons, typically used to fire in most shooters, can toggle between hair trigger mode and regular mode using two sliding locks on the underside of the controller. Hair trigger mode offers a shallower press (roughly half as deep as regular), leading to more rapid-fire shooting and a fraction of a second shorn from the player’s fire response. The four new buttons are mapped with the four face button functionalities by default, but if you want to change them–and you will, since that’s the whole point of owning a Raiju–you’ll need to download the Raiju app on an iOS or Android device. Using Bluetooth, the app lets you assign these four extra buttons however you like, and new profiles can be created and swapped between via a smartphone or tablet. It’s also possible to adjust the sensitivity of the analog sticks on the fly. This is done via the app, where a toggle button can also be assigned to skip between default and customised sensitivity. While assigning these buttons and adjusting these sensitivities can improve the quality of life in plenty of games, in theory it’s most useful in competitive titles – think stuff like Rainbow Six: Siege and Fortnite. For the latter, it can mildly improve the efficiency of building, because accessing inventory and toggling build mode using M1 and M2 feels slightly more fluid. It’s also useful for complex games like Divinity: Original Sin 2 or Final Fantasy XIV – games that have extensive controller modes but which can nevertheless suffer under the button limitations of the DualShock 4. Still, while it makes sense to want to play Divinity: Original Sin 2 or FFXIV on the couch, the Raiju can’t possibly replace the mouse and keyboard as preferred input for games like Siege, Call of Duty, Fortnite… or any other online PC shooter, really. It’s unlikely players with competitive aspirations will want to sacrifice their mouse and keyboard for the Raiju, which means its value proposition falls far shorter on PC than it does on PS4. So unless you simply must use a pro-level controller, the price tag isn’t getting you a potential competitive advantage – it’s just getting you a really nice controller. We had the Raiju working and re-mapped using the Android app within minutes — you will have to sign into (or sign up for) a Razer account, though. As mentioned, the app is used to adjust analog stick sensitivity, while the intensity of the left and right controller vibrations can be adjusted too. Unlike its predecessors the new Raiju has wireless functionality, but that doesn’t apply to the headphone jack. If you’re accustomed to plugging your headset straight into your DualShock 4, you’ll only be able to do so with the Tournament Edition while it’s wired. That’s obviously a disappointment, though there’s no official support for the headphone jack on PC, anyway – none that works as seamlessly as it does on the PS4. Since connectivity options on PC are much more extensive than on PS4, it’s not a big issue. If you want a controller that feels like a jewel, it’s hard to pass up the Raiju. It’s basically a third-party PS4 equivalent to the Xbox One Elite Controller – not an equivalent PC needs, since we can use the Elite. On that note, the Elite costs less than the Tournament Edition and offers more customisation (including detachable analog sticks and more), though it's worth keeping in mine that to use the Elite wirelessly, a US $25 USB adapter is required. With that in mind, it’s harder for the Raiju to compete for the title of best “pro” game controller for PC: the market is far less crowded on PS4. But it’s a step in the right direction for Razer.